People walking on a street in the YPG-held northern Syrian town of Manbij, June 6, 2018. People in the northern Syrian city of Manbij have demanded the removal of the PKK terrorist organization-affiliate People's Protection Units (YPG) and their so-called representative the Manbij Military Council (MMC). "The people of Manbij are tired of the YPG's oppressive actions. The people want an honorable life and want to cast off terrorism and fear with the support of Turkey and its allies. Although it is claimed that a civilian council was formed to administer the city, in reality, the city is ruled by the YPG's high-ranking members," the head of the Syrian Turkmen Assembly, Muhammed Vecih Cuma, whose hometown is Manbij, told Daily Sabah. The U.S.-backed Syrian Democratic Forces (SDF), which is dominated by YPG terrorists, made its way to Manbij in August 2016 after ousting Daesh terrorists who had captured the city from the moderate opposition in January 2014. Before the YPG's grip on the city, Manbij was administered by the Revolution Assembly, which had represented 17 different groups and tribes. Yet, after the terrorist organization entered the city, the MMC, a militia allied to the U.S.-backed SDF and YPG, begun to self-impose its de facto administration in the city. Turkey opposes the YPG's presence in Manbij which has been a major sticking point in the strained relations between Turkey and the U.S., due to the latter's support of the group under the pretext of fighting Daesh. The YPG has organic organizational and operational links with the PKK. The PKK has claimed the lives of more than 40,000 people in its 30-year terror campaign against Turkey. The U.S., however, while listing the PKK as a terrorist group, had provided military training and given truckloads of military support to the YPG, despite Turkey's security concerns. In an effort to assuage the security concerns of Turkey, Washington and Ankara reached the Manbij agreement in June 2018 that focuses on the withdrawal of YPG terrorists from Manbij to stabilize the region. The deal presented a three-stage process to be realized within 90 days: The withdrawal of the terrorist organization, joint Turkish-American patrols which began in November 2018 and the establishment of a new local administration made up of people who reflect the ethnic composition of the area. 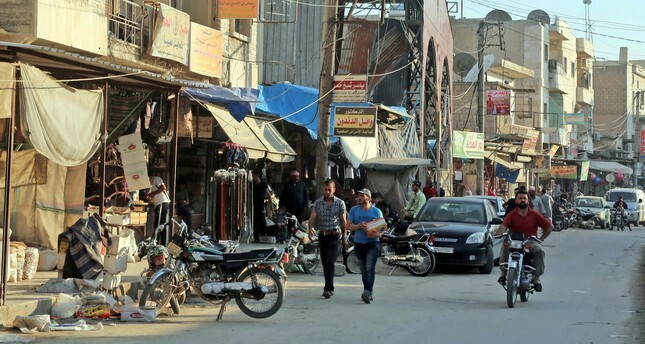 Ankara has emphasized the handing over of the administration of Manbij to the people of the city that is largely populated by Arabs who are almost 90 percent of the population. "As Turkey does not intend to stay in the Syrian territories, Ankara's Syrian policy mainly focuses on handing over the cities to the original owners. Turkey wants the inhabitants of Syrian cities to locally govern themselves, on their own, by establishing local assemblies," Kemal İnat, an academic at Sakarya University, stated in his interview with Daily Sabah. Stressing that the people of Manbij will not be represented under the control of the U.S.-backed YPG or under the regime, İnat said that a council formed according to the demographic composition will be in the best interest of the people. In relation to the formation of the local council in line with the Manbij deal, Nihat Ali Özcan, from TOBB University of Economics and Technology (ETÜ), told Daily Sabah that despite different voices, the U.S. and Turkey should make a detailed list of the demographic structure of the city in order to include people from different ethnic backgrounds into the local council. Pointing out that the Kurds of Manbij will be also included in the local council as they are also the inhabitants of the city, Özcan said that the main thorn between the two NATO allies will be determining which Kurds should be included in the council and which ones belong to the YPG. In the face of an imminent Turkish operation into YPG-held areas, U.S. officials voiced similar remarks repeatedly in a bid to equate the Kurdish people with the YPG, referring to the terrorist group as the representative of Syrian Kurds. This rhetoric has drawn harsh criticism from Turkey, home to 512,708 Syrian Kurds who fled from YPG-held areas. In addition to its rhetoric of associating the YPG with Syrian Kurds, Washington also has been dragging its feet on the implementation of the Manbij deal, leading to greater suffering of the people of Manbij at hands of the terrorist organization. Commenting on the sluggish process of the deal, Oytun Orhan, an expert on Syria, highlighted that the delay in the implementation of the Manbij road map was stemming from the resistance of some circles in the U.S., especially the Pentagon and the U.S. Central Command (CENTCOM), in the political decision. "However, there is a different atmosphere now. The White House's determined stance to pull its troops out of the country does not render a stalling policy of the U.S. possible anymore," Orhan said. He added that these circles also understood the unsustainable nature of the stalling policy in the face of the withdrawal and accordingly the technical work in regard to the Manbij deal and the establishment of the local council. In December, U.S. President Donald Trump announced that the U.S. would withdraw its troops from Syria, saying that the only reason U.S. troops were in Syria was to defeat Daesh, and this mission had been accomplished. Trump's abrupt decision caught U.S. lawmakers and many military leaders by surprise, prompting a wide criticism. Washington's withdrawal gave rise to a range of questions that need answering including its cooperation with the terrorist organization, the future of the Manbij deal and who will fill the power vacuum when the troops leave. The only solution on the table, for the time being, is the establishment of a 32 kilometer deep safe zone along the southern Turkish border. Such a safe zone will clear all terrorist elements, especially the YPG, along the Syrian-Turkish border and may create a humanitarian corridor to protect civilians. Pundits believe that the Manbij deal may set an example for a terrorist-free safety zone border to be set up under the administration of Ankara after the U.S. withdrawal from Syria. One of the articles of the Manbij road map also said that if the Manbij model proves to be a success, Turkey will push for a similar arrangement in eastern Syria to remove terrorist elements, and the possible extension of the deal, to other areas under the control of the YPG. In relation to the issue, Orhan highlighted that it does not seem likely for the U.S. to implement the deal east of the Euphrates and the areas beyond the safe zone as Washington has tried to find a middle ground between Turkey and the YPG. Orhan, highlighted that the U.S., however, will lose some of its influence during the withdrawal process and will have to work with Turkey.